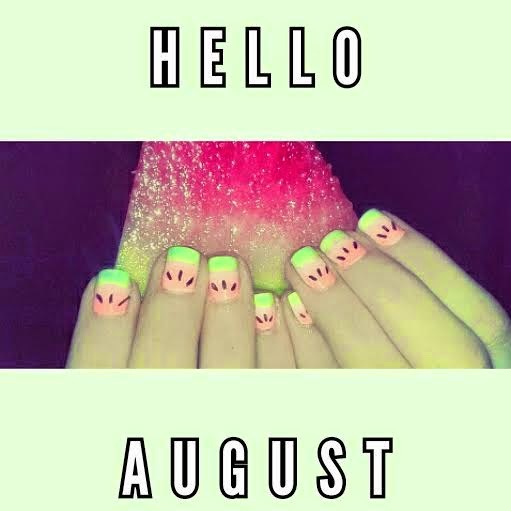 Hello August and hello watermelon nails. What you gonna need to achievethis nail effect . Let's begin: First apply your fav base coat, then with the white nail polish apply one coat of it. Let it dry and then take your make up sponge and apply one layer of pink or coral on top , white in the middle and green on the bottom so we can have the ombre effect on our sponge. Next step is to dab on your finger the make up sponge with the three colours in a slight up and down motion to create the ombre effect. Apply a top coat before you draw some seeds on the pink side ,we do this step to settle the colours in place and be more gradient . Let the top coat dry and later apply some seeds and again a generous amount of top coat....Aaaand your done!!!! Here are two viedo tutorial that I found ..the one is with the ombre design and the other is with a siple one (the other one is for you loves that you are not fan of ombre nails) enjoy !! !